J'en veux ou j'pleure ! Dommage, mon père Noël est déjà passé, et il est ruiné ! 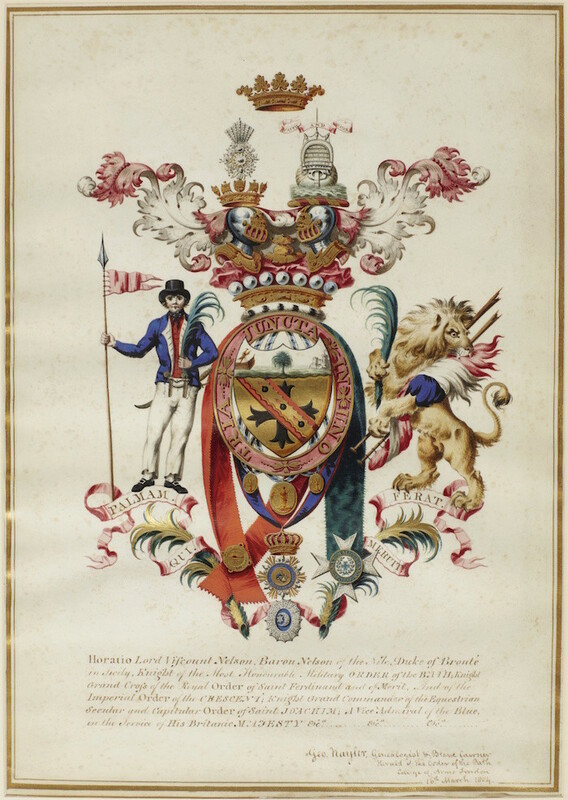 Signed and dated by Nayler as Blane Coursier Herald and Genealogist of the Order of the Bath, College of Arms, 16 March 1804. Nelson's arms were a cross fleury sable, a bend gules, surmounted by another engrailed of the field, charged with three bombs, fired proper, augmented after the Nile (as here) with a chief undulated, argent, thereon waves of the sea, from which a palm tree issuant, between a disabled ship on the dexter and a ruinous battery on the sinister. He chose as his supporters (who after the Nile bore palm leaves) dexter a sailor armed with a cutlass and pair of pistols supporting a staff thereon hoisted a Commodore's flag gules, sinister a lion rampant in his mouth a broken flag-staff, a tri-coloured flag in his mouth. The arms bear a Viscount's coronet (his English title taking precedence over his Sicilian Dukedom). 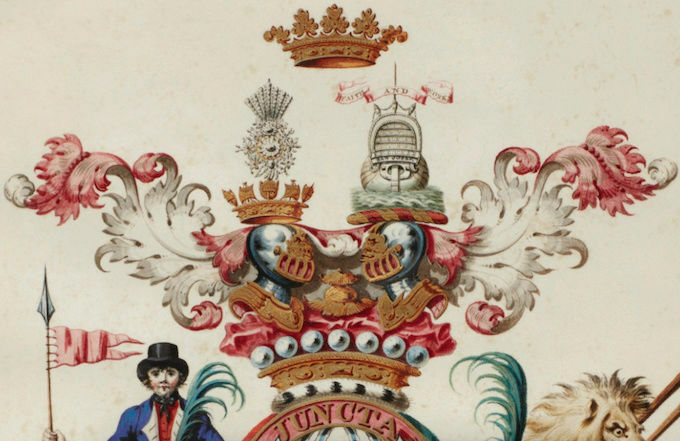 The crests of the two helms are, dexter, the Chelengk, or plume of triumph, given to Nelson by the Ottoman Sultan after the Battle of the Nile, and sinister, the stern of a ship inscribed "San Josef", the Spanish battleship he took at the Battle of Cape St Vincent. His motto, "Palmam qui meruit ferat" [Let he who has earned it take the palm], was also granted after the Nile. Finally, the achievement includes the insignia of the orders of honour conferred on Nelson: the Bath, the Sicilian Order of St Ferdinand and of Merit, the Ottoman Order of the Cresent, and the Germanic Order of St Joachim. 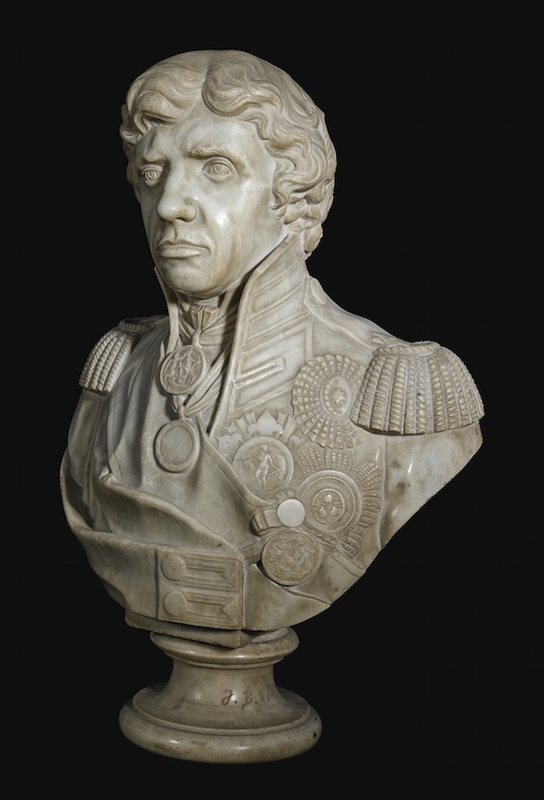 The herald George Nayler (1764-1831), had worked closely with Nelson in the original design of his arms and was later to serve as one of the three officials who were deputed by the Admiralty to receive Nelson's body from the Victory. The original purpose of this splendid document is not known but it may have been intended for the heralds of Sicily. 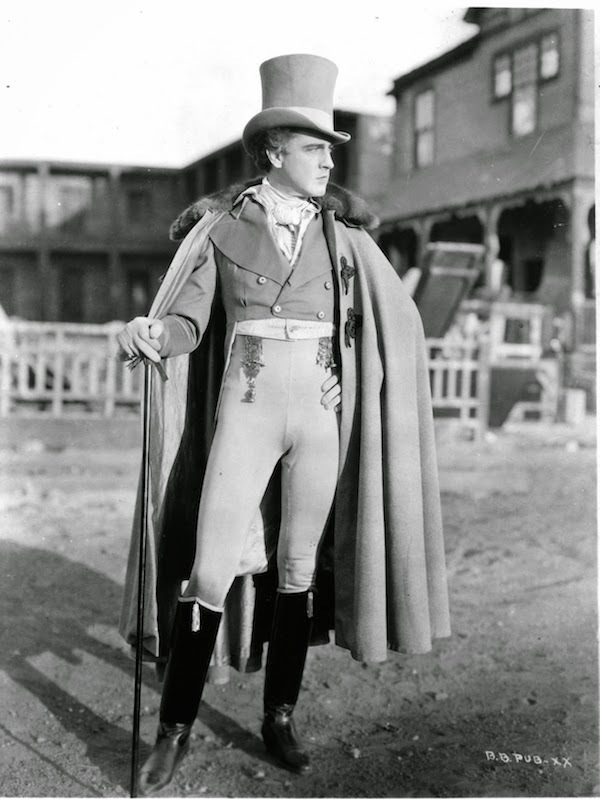 "I have sent to Sicily for the Arms of Bronté, and the Heralds College there has sent for my English Arms, in order that they may be enrolled amongst those of the Sicilian Nobility ; therefore you will be so good as to send me out the same sort of thing which I sent to Germany. 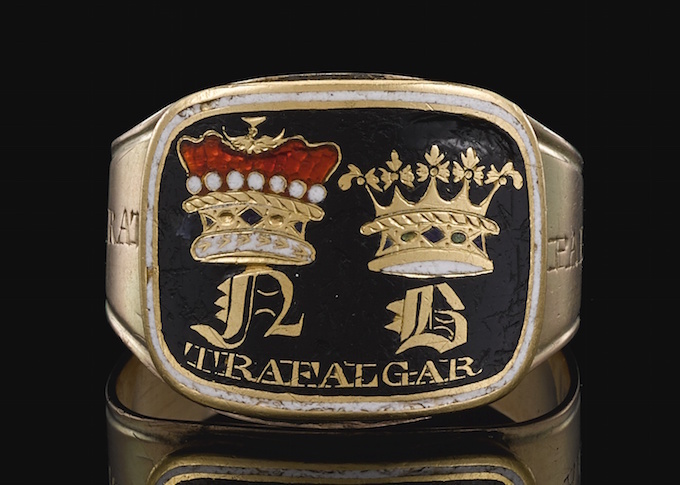 After the death of Vice-Admiral Horatio Nelson at the battle of Trafalgar on the 21st October 1805, memorial rings were distributed by his executors, the Rt. Hon. Earl Nelson and J. Haselwood, to relatives, personal friends and the pall bearers. Enamelled in black with a white border, each was decorated with the letters N for Nelson surmounted by a viscount’s coronet with seven pearls to commemorate Nelson’s appointment as viscount after the battle of the Nile in 1798, and B for Bronte surmounted by a ducal coronet, representing the Sicilian dukedom of Bronte conferred by Ferdinand IV of the Two Sicilies in 1799, with Trafalgar beneath. 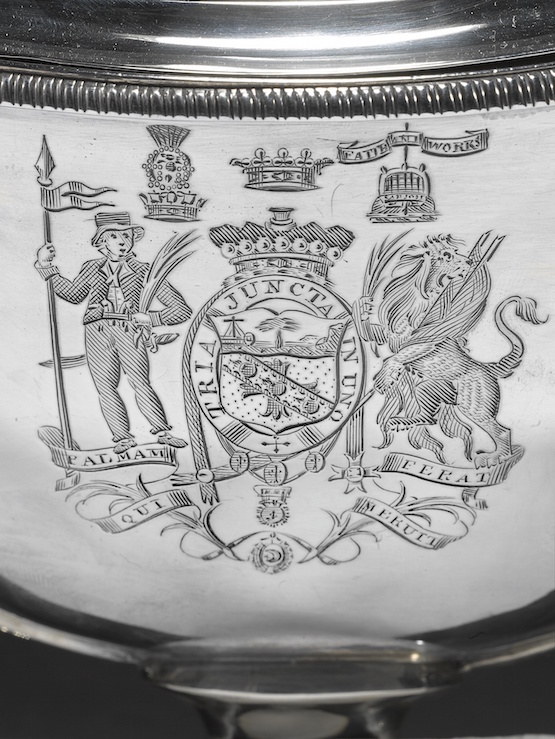 The hoops were engraved to the outside with ‘PALMAN QUI MERUIT FERAT’ (Let him bear the palm of victory who has won it) which was granted to Nelson in 1778 and taken from the poem ‘Ad ventos’ written by John Jotin in 1727. 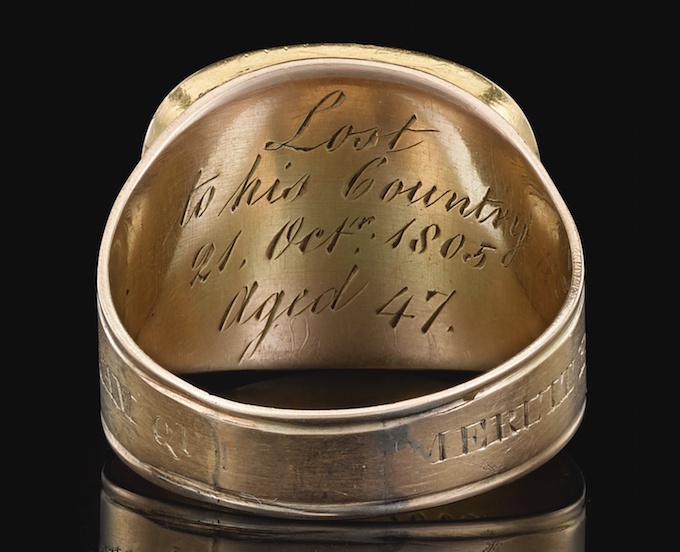 Approximately fifty-eight of these memorial rings were distributed by the executors of Nelson’s will, thirty-one going to members of Nelson’s immediate family, while a manuscript held in the British Museum lists the original recipients of the rings. 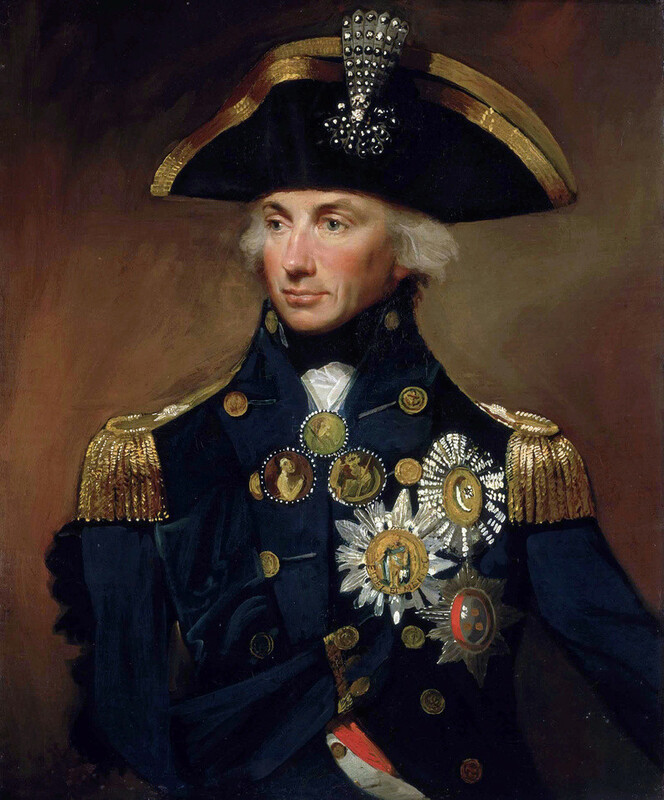 In the present portrait, Nelson is depicted in rear-admiral's full dress uniform and wearing various decorations, including the two large naval medals he was awarded for the battles of Cape St Vincent and the Nile: a third was award posthumously for Trafalgar, the other decorations are the order of the Crescent, given to Nelson by Sultan Selim III, the Neapolitan order of St Ferdinand (to the left of the Crescent), and below these the Most Honourable Order of the Bath, awarded in 1797. 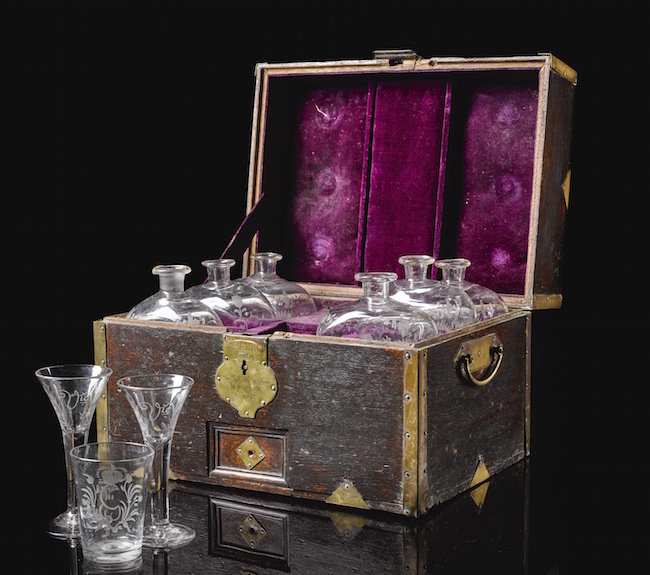 Provenance : On their receipt is written that 'This chest formerly belonged to Admiral Nelson, was inherited by the godson Horatio Nelson Atkinson, the son of the Master of the Victory at the Battle of Trafalgar. It came into the possession of M.H. Todd of Keswick, Cumberland and passed by descent from her nephew John Frederick Foster to Elizabeth Foster, Duchess of Devonshire. 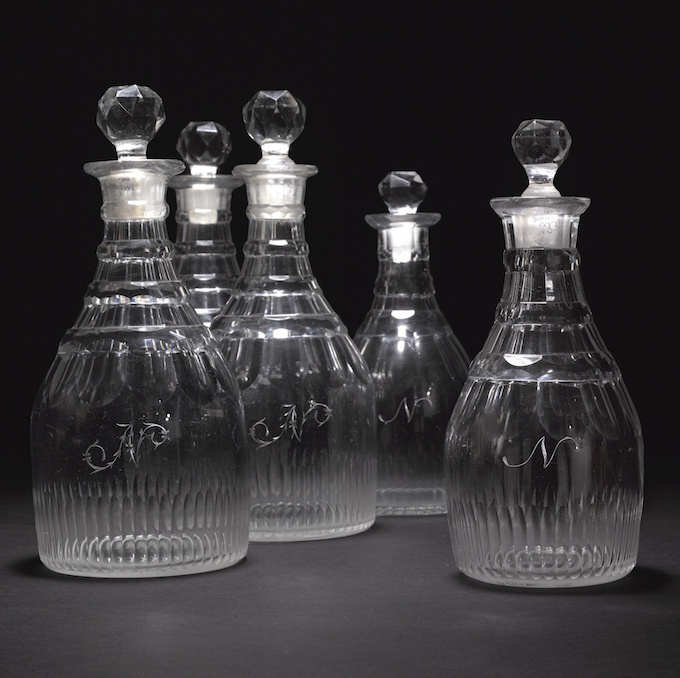 The Merton Inventory compiled after the death of Lord Nelson lists all of Emma Hamilton's possessions at her 'Paradise' Merton Place. 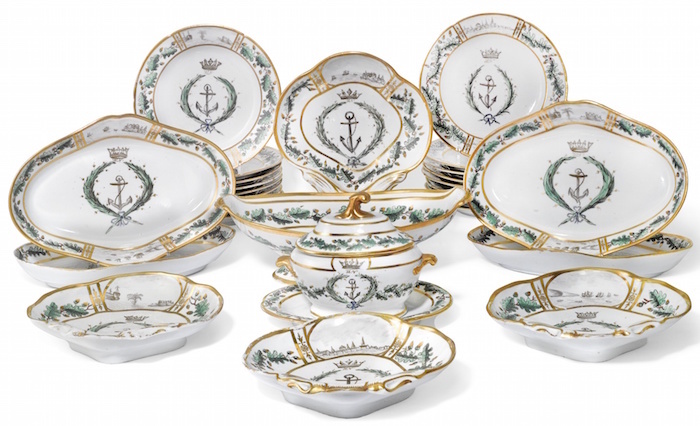 The inventory listed five named services including the 'Nelson service', a dessert service, London-decorated on Coalport and Paris porcelain, painted at the centres with the full coat-of-arms of Horatio, Viscount Nelson; and the’ Baltic Service’, a tea and coffee service London-decorated on Paris porcelain, inscribed ‘Nelson/ 2nd April/ Baltic'. Both services like the present service are decorated with an oak-leaf border. 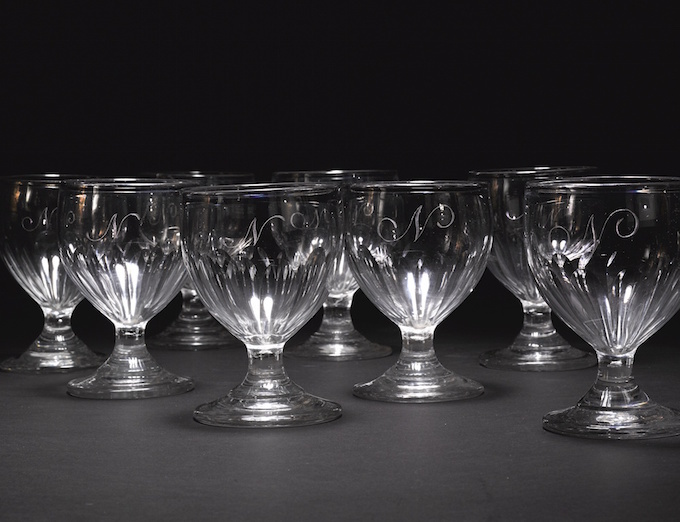 It has been suggested that the present dessert service may have been a gift from Nelson to his sister Catherine ‘Kitty’ Matcham (1767-1842). 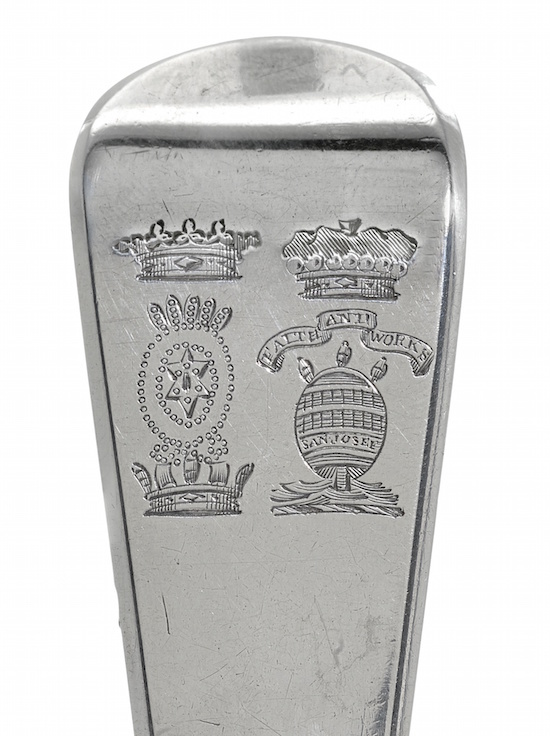 Engraved with Nelson crests; the first with star representing the Order of the Bath and naval crown surmounted by a duke's coronet, the second with motto 'Faith and Works' and ship's stern inscribed 'San Josef' surmounted by a baron's cap. 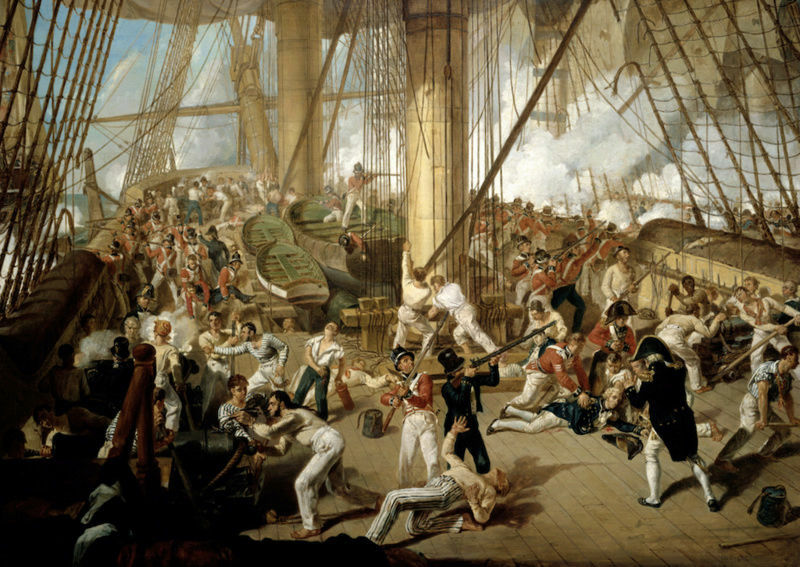 Britain’s famous victory over the combined Spanish and French fleets at the Battle of Trafalgar in 1805 was the Royal Navy’s greatest victory - affirming Britain’s maritime supremacy and dashing Napoleon’s ambitions for an invasion. 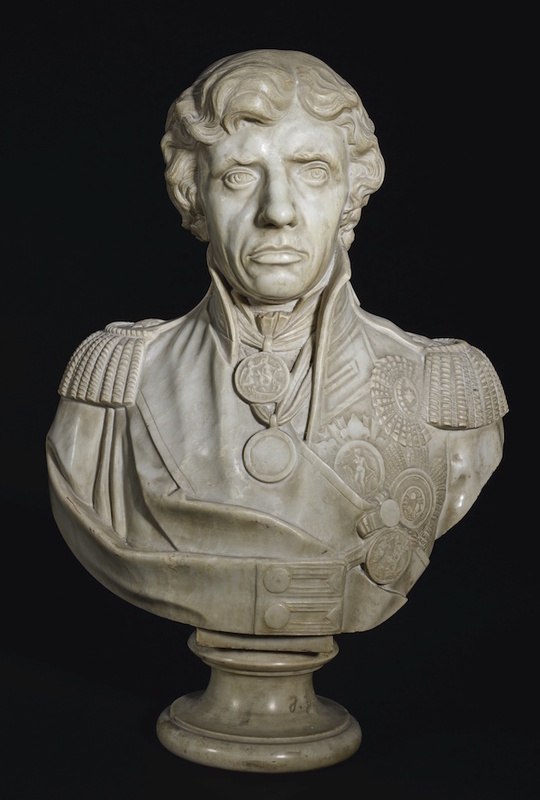 Lacking a numerical advantage but confident in the superior seamanship and gunnery of his crews, Lord Nelson devised a bold and unorthodox military tactic to split the enemy line by attacking it in two columns. It proved a masterful stroke, and his death in the course of his greatest triumph immortalised his memory in the nation’s history. 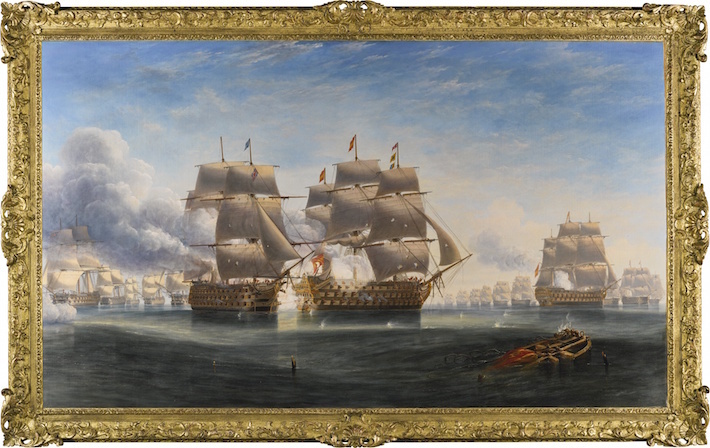 In the present painting, Carmichael depicts the decisive moment when Rear Admiral Lord Collingwood, in command of ‘Royal Sovereign’, broke through the Spanish line and rounded on ‘Santa Ana’ – the huge 112-gun Spanish flagship of Vice-Admiral de Alava. All fifty of 'Royal Sovereign’s' port broadside, double shotted, poured into ‘Santa Ana’s’ unprotected stern at a range of thirty yards. Then, putting his helm hard over, Collingwood ranged up the lee side of the Spaniard for the coup de grace. 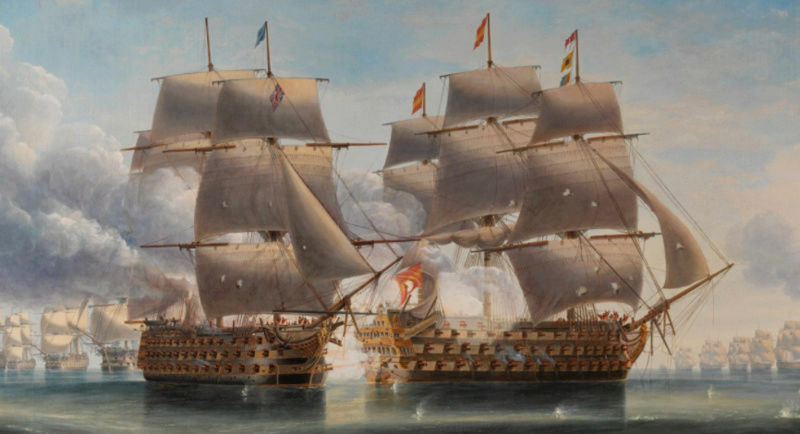 It proved the brilliance of Nelson’s strategy, and Collingwood’s manoeuvre was completed even before ‘Victory’ herself entered the fray at the head of the other column. 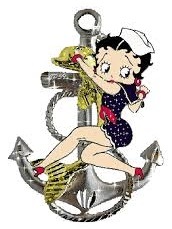 "When in the presence of an Enemy, all the Ships under my command are to bear white Colours [i.e. St George's Ensign], and a Union Jack is to be suspended from the fore top-gallant stay" (10 October 1805). 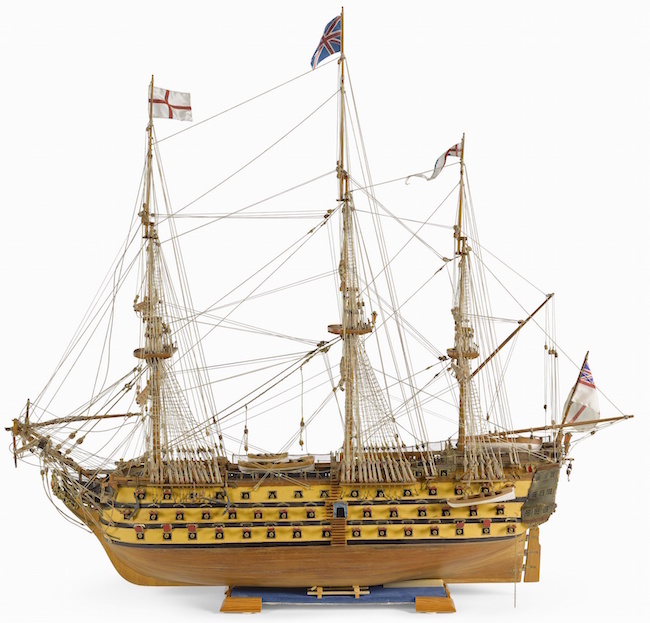 HMS Victory consequently flew two Union flags and a St George's Ensign, which were returned to England with the ship and the body of Nelson. 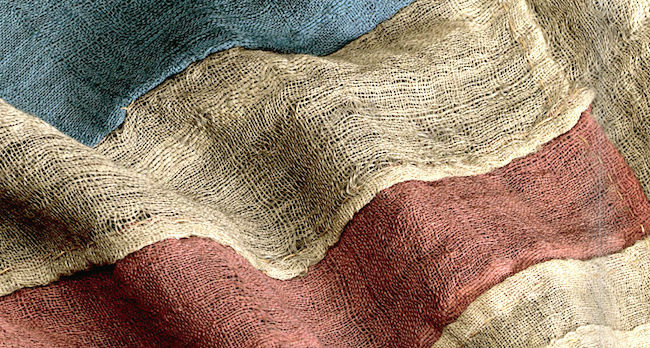 These battle ensigns, unique patriotic mementoes of Nelson's final and greatest victory, were later woven into the solemn and dignified series of ceremonials that marked his state funeral in January 1806. The body lay in state at the Painted Hall at Greenwich for four days before processing upriver in a funeral barge with a flotilla of naval escorts, disembarking at Whitehall Stairs and resting overnight in the Admiralty. 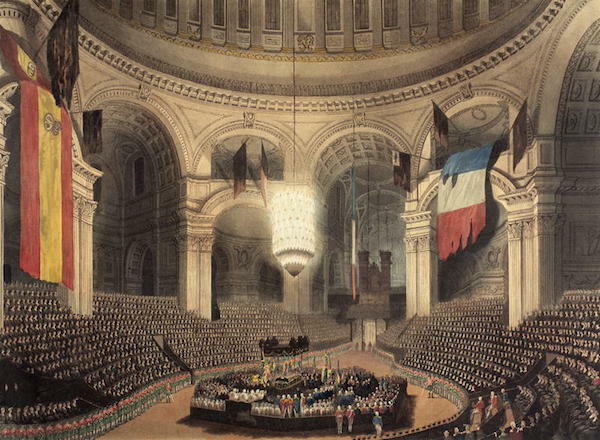 The following day, 9 January, a vast procession followed Nelson's remains to St Paul's Cathedral, the site of the funeral. Incorporated into the funeral cortege was a group of 48 seamen and Marines from HMS Victory, who bore with them the ship's three battle ensigns and were, according to one eyewitness, "repeatedly and almost continually cheered as they passed along". At the conclusion of the funeral service, with the coffin placed at the heart of the cathedral beneath Wren's great dome, the sailors were supposed to fold the flags and place them reverently on the coffin. Most of the surviving fragments of the Victory's flags are much smaller than the current piece. Small fragments of white and blue bunting, no more than 12cm in length, have appeared at auction and other similar fragments are found at the National Maritime Museum and other institutional collections. 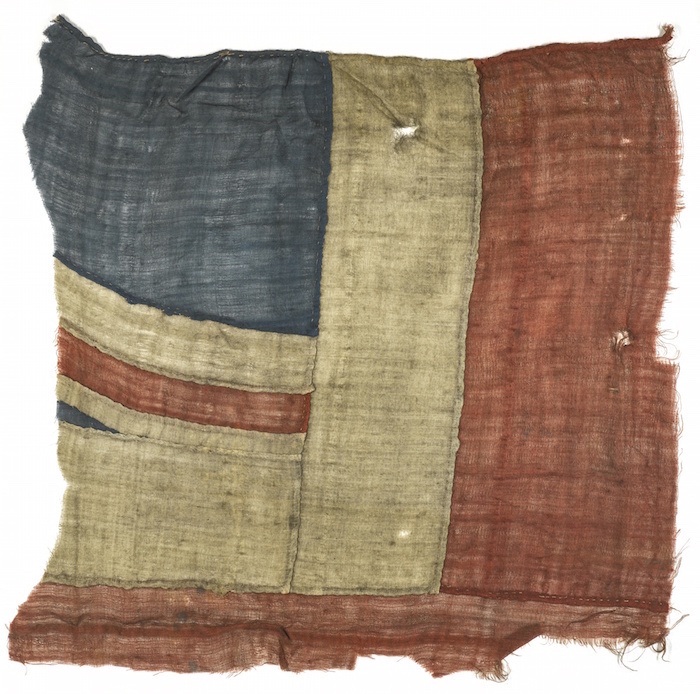 Only two complete Union jacks that were used as battle ensigns at Trafalgar survive: one from HMS Minotaur (National Maritime Museum), the other from HMS Spartiate. Merci, merci, pour ce magnifique exposé !!! J'ai presque envie d'acheter le catalogue ! Dernièrement, Franck Ferrand consacrait l'un des épisodes de son émission de radio, Franck Ferrand raconte (Radio Classique) au célèbre Horatio Nelson, et en particulier à la bataille qui consacrera sa légende et où il trouvera la mort : Trafalgar ou le Waterloo sur mer. 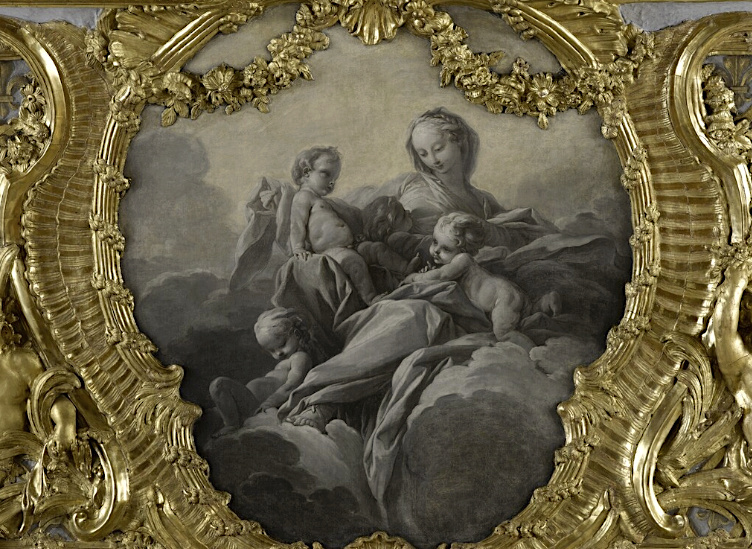 Talleyrand, Nelson ... Ma parole, Clio n'aime que les estropiés; il les lui faut tous ! Momo, tu as toutes tes chances !!! Notre chère Clio aime les hommes qui sortent du commun des mortels. » DUMANOIR LE PELLEY,Vice Amiral.